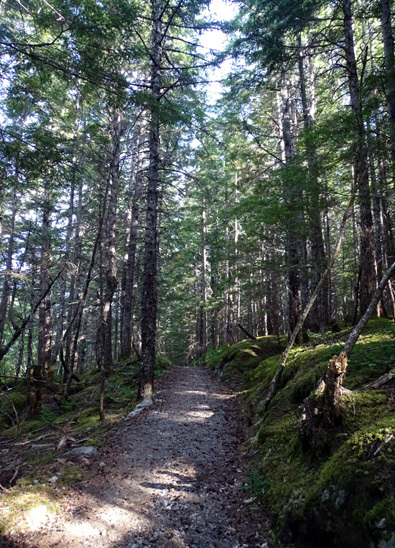 times very steep and the trail can be rugged, but it's not a technical climb." The views above treeline on Mt. Ripinsky, and especially from the panoramic north peak, are awesome, rivaling anything I've seen from the summit of 14ers in Colorado like Mts. Elbert and Massive. 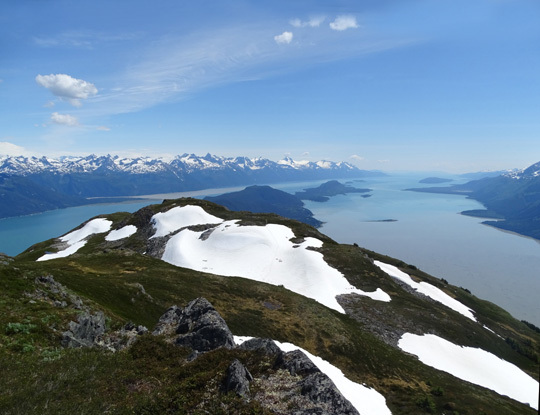 When I had my first views down to the Lutak Inlet, Lynn Canal, Portage Cove, and Chilkat Inlet on my way up the south side of Mt. 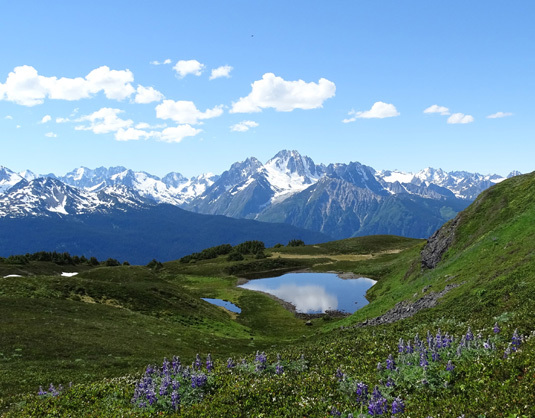 Ripinsky, surrounded by snow-capped mountains with glaciers in every direction, I had about the same sense of joy and wide-eyed wonder that Dorothy probably did when she landed in the magical Land of Oz. 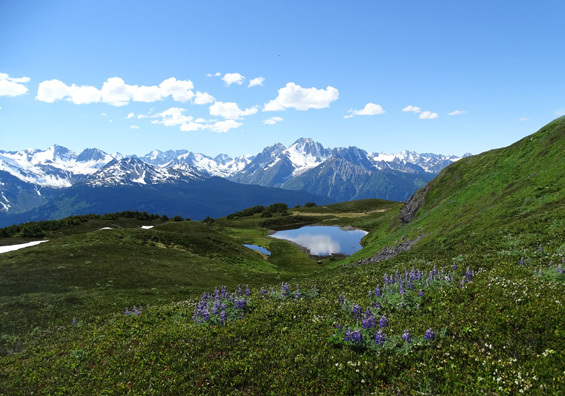 Takhinsha Mountains in the background, on the other side of the Chilkat River. Just spectacular! I couldn't wait to see what was around each curve or over each false summit. And I didn't have to climb 12,000-14,000 feet in elevation to see great water and mountain views. 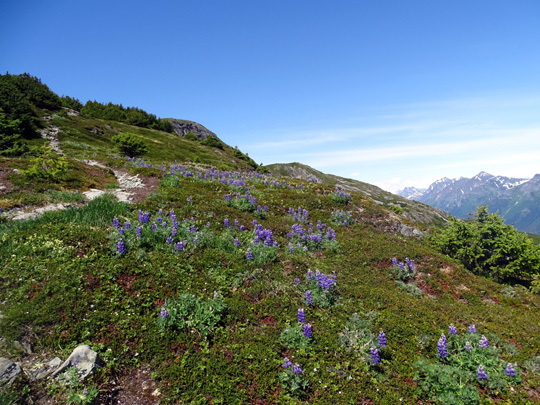 Timberline in this area of Southeast Alaska is 3,000 feet or less. 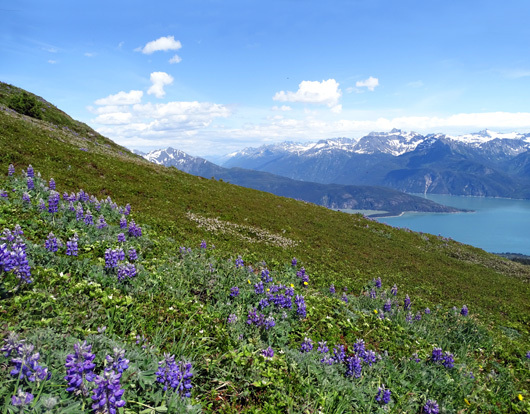 More flowers, fewer and shorter trees and shrubs as I neared "tree line"
Not that the climb to the two peaks was easy. It wasn't. It was just a lot shorter than the trek up any of the Colorado 14ers I've climbed and I wasn't oxygen-deprived. 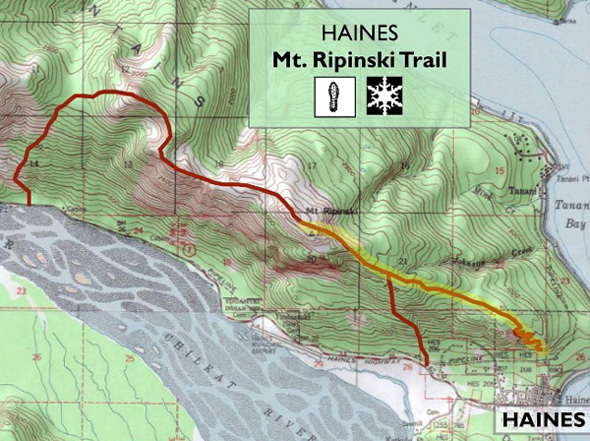 After I read the three trail descriptions in the "Haines Is for Hikers" brochure I chose the most popular route up the mountain from the end of Young Rd. on the northeast edge of town. 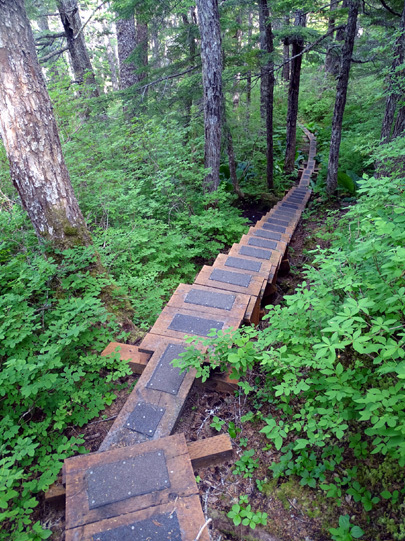 It's called the Skyline Trail. 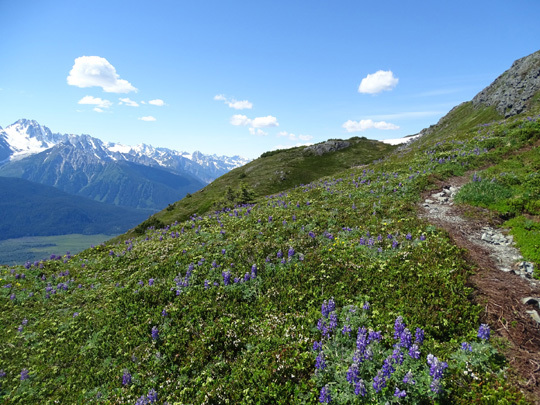 The rugged trail climbs about four miles across the south peak to the north peak. 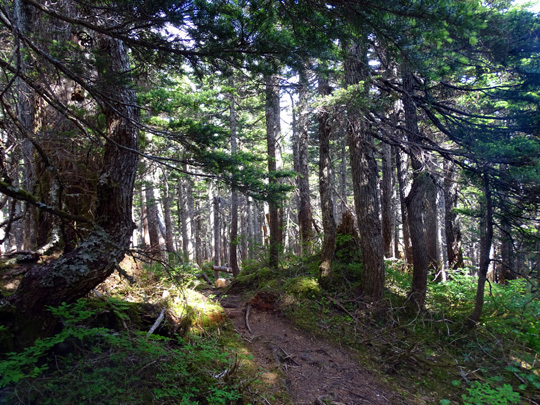 There is another peak that is higher at 3,920 feet but I didn't go that far today. It's another 2.8 miles beyond the north peak, where I turned around. 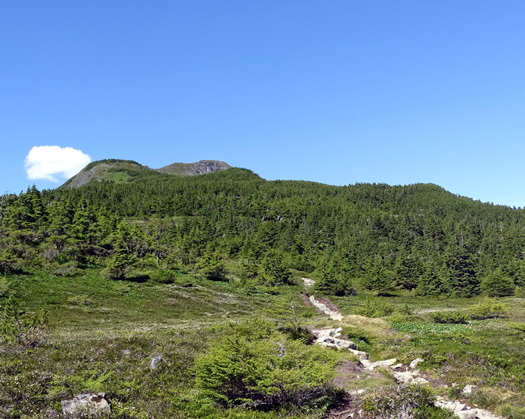 If we're ever here again it would be interesting to take the 7-Mile Saddle Trail out-and-back from the north side of the mountain to this peak (3.2 miles one way), or do the 10-mile traverse from the northern trailhead to the southern one. With that option, I'd need Jim to drop me off at one end and pick me up at the other. 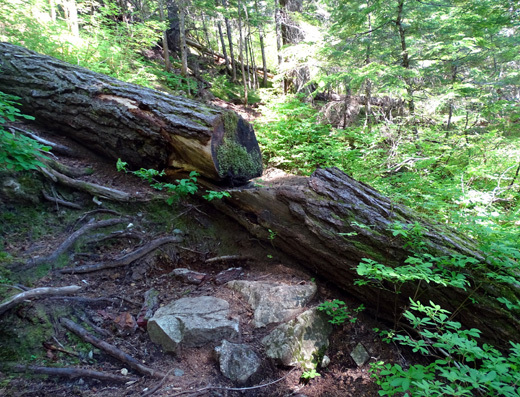 The brochure states that all three trails up this mountain are for "fit and experienced hikers only." Jim basically said, "Have fun!" and chose to ride his bike closer to sea level instead. The distance was too long for Cody, and I can't hike safely with Casey on a leash on steep, rough terrain, so I did the hike solo. 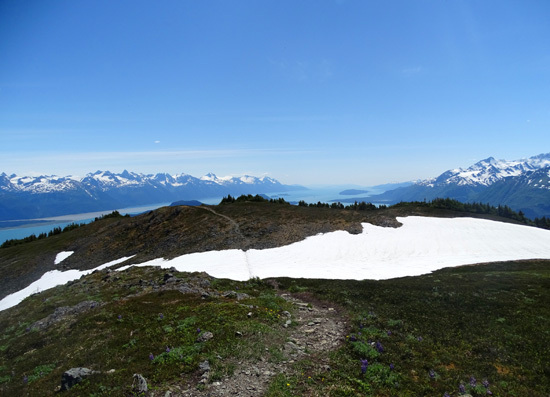 Looking back at the end of the summer I can say that this was my second or third favorite hike in Alaska. The rest of this account is from notes I wrote a few hours after my hike. 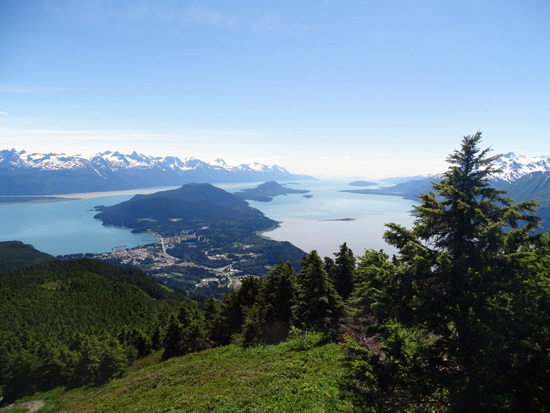 This was our second perfect-weather day in a row in Haines -- sunny, mid-60s F. overnight to low 80s F. during the day. That's warmer than normal for mid-June. There was minimal wind today, even on Mt. 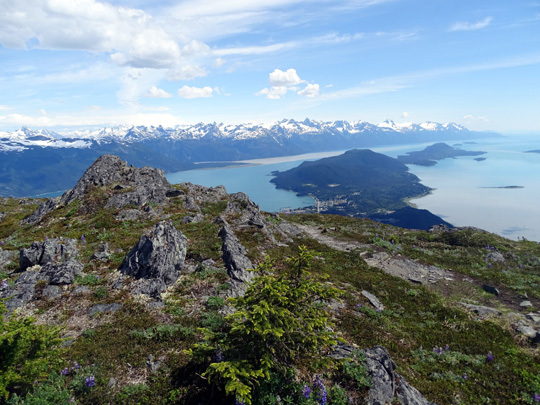 Ripinsky's summit, and the humidity was in the 20s, extremely low for this coastal area. 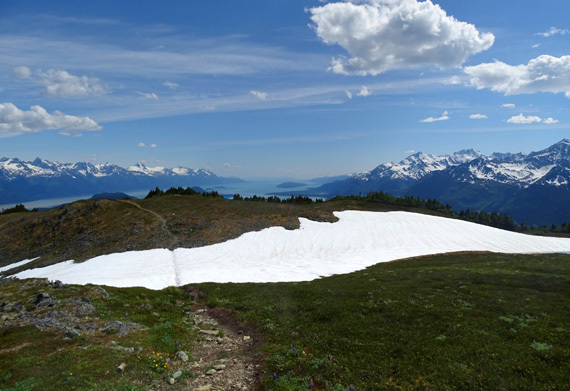 The thought occurred to me several times on this mountain that three years ago on this date, I wouldn't have been able to climb it because of too much snow. 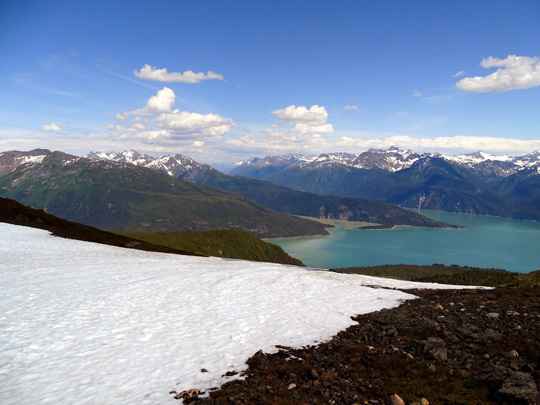 That was a record-setting snow year and I was unable to hike some of the trails I wanted to hike in Alaska, especially in June. Although I had to hike through some snow today it was easy and made the trek more fun. Because of the high temps and low humidity in Southcentral Alaska this year there are two large wildfires that began yesterday and are spreading rapidly. The worst is near Willow; it has shut the Parks Hwy. off and on for several miles, not only creating havoc for residents and tourists but also destroying forests, houses, and other structures. 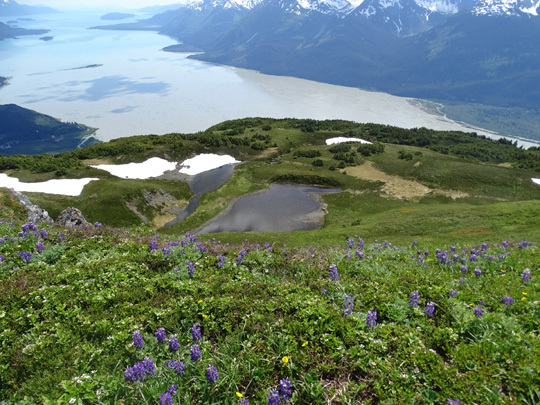 Yesterday Jessica, my Chilkat River float guide, mentioned the give and take, good news-bad news of Alaska weather. In high snow years there is plenty of moisture, fewer bugs in the summer, and people who love snow (or are in the snow business) are happy. However, there is higher risk of flooding in the spring and summer. 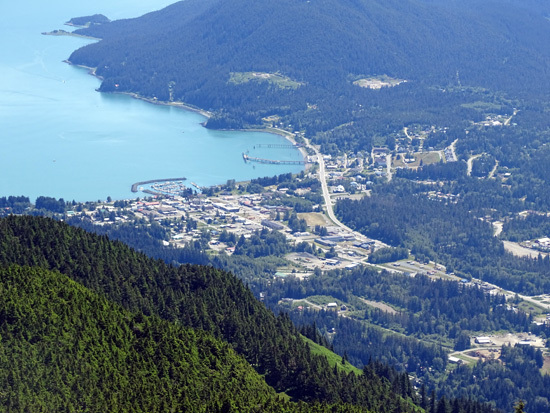 In low snow years the tourists and residents are happy with early spring and summer weather but the bugs are worse and wildfires are more likely. It's interesting that we've seen both extremes in 2012 and 2015. 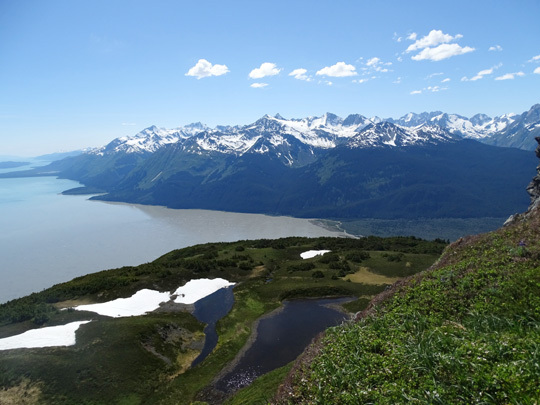 I checked off the last item on my Haines 'To Do" list today -- climbing up to the 3,690-foot north summit of Mt. Ripinsky. 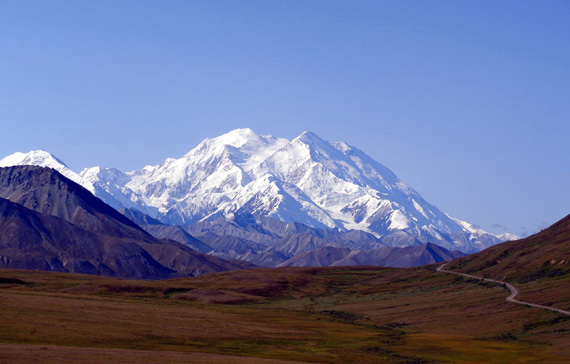 I have been looking out the window at that mountain for seven days. Yup, that's our camper and truck! Quite a different perspective . . . 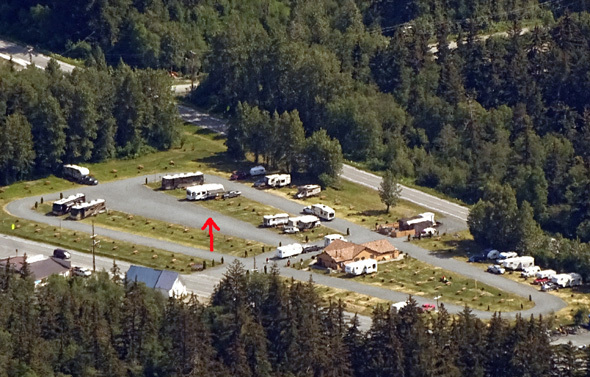 It is easy to spot the Haines Hitch-Up RV Park from high up because of its location and layout. 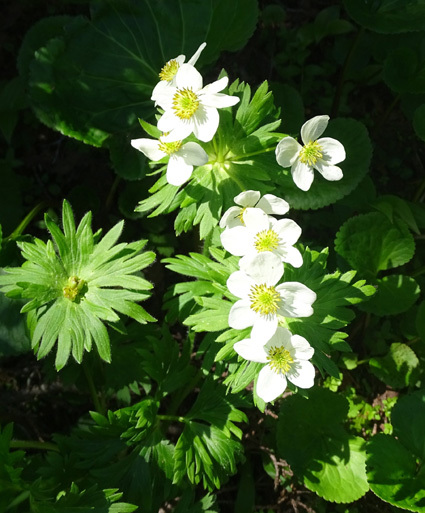 Our Cameo is white, easy to see against green grass, and I knew its position in the campground. 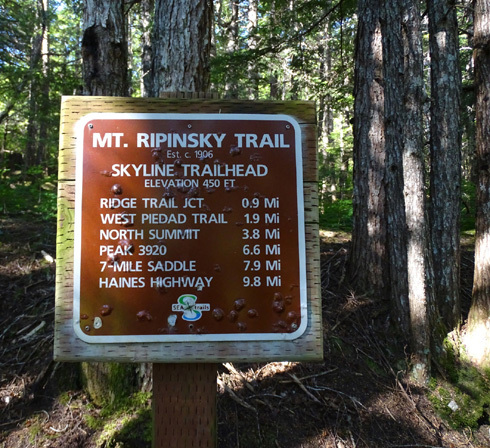 Jim wanted to use the truck today so he dropped me off at the main Ripinsky trailhead at the top of Young Rd. 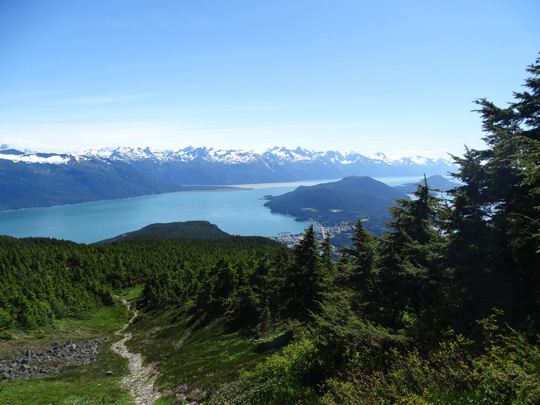 in Haines. The hike to the north peak registered 3.9 miles on my GPS. 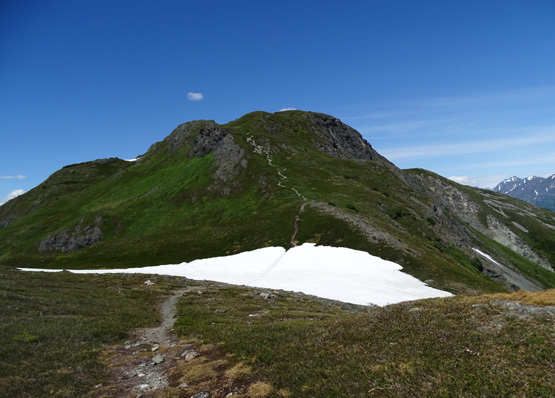 I had a total of 8.05 miles because of wandering around the summit and going off-trail to see some mountain goats and views. Total elevation gain and loss was about 7,000 feet. 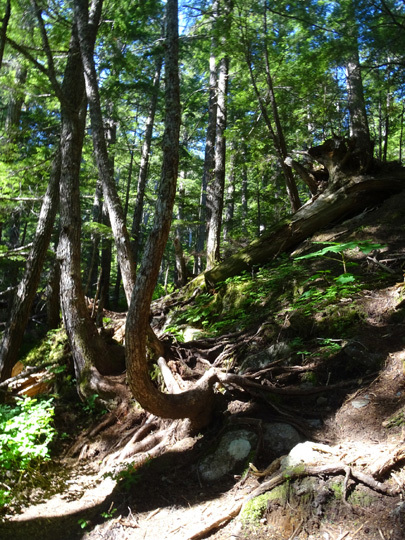 This is a rather difficult trail, partly because of the rough roots and rocks through the forest and partly because of some steep sections after the trees thinned out. 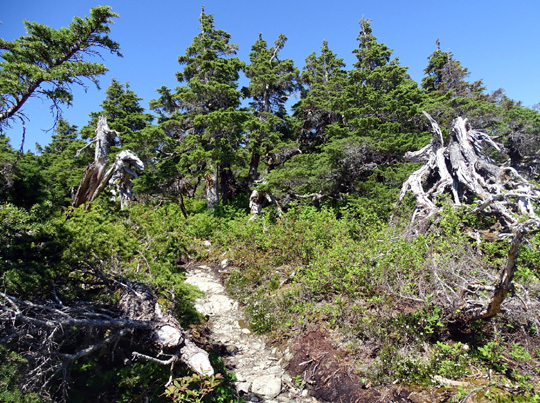 It reminded me of the worst of the Appalachian Trail in Maine and New Hampshire. 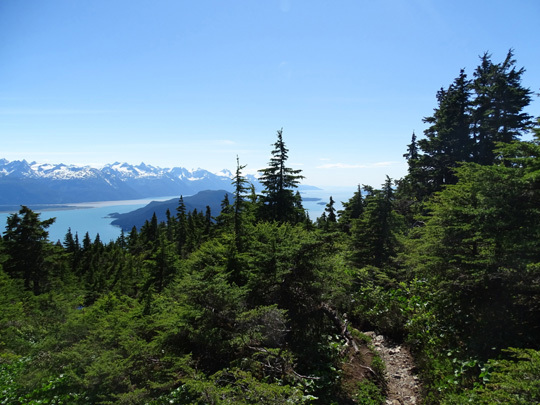 Fortunately, I kept going and was rewarded with fantastic views once I got above most of the trees. 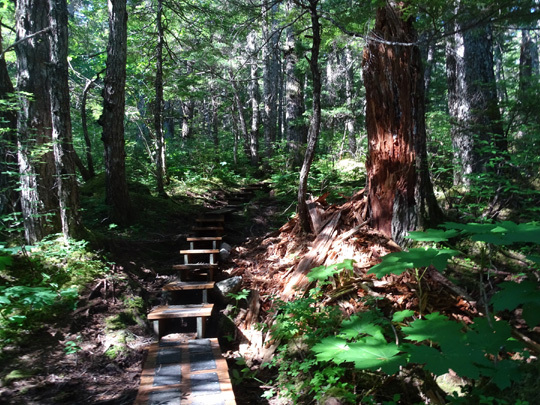 The trail starts off pretty nice, with lots of new, slip-resistant bog boards and steps from about 4/10ths to 6/10ths mile into the hike. I saw various styles and configurations of boards, some that I haven't seen before. Smooth sections like this don't last long. I took this shot going back down the mountain. 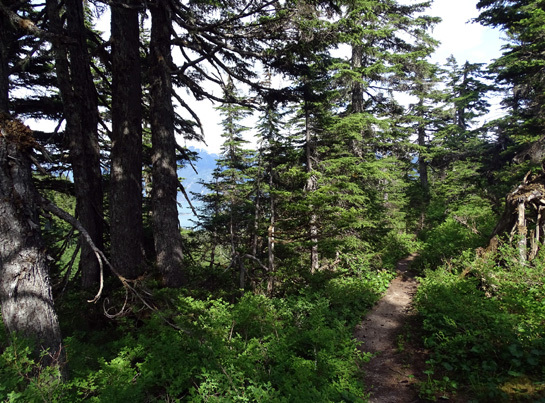 The trees, understory plants, and wildflowers morphed noticeably as I climbed higher and higher. 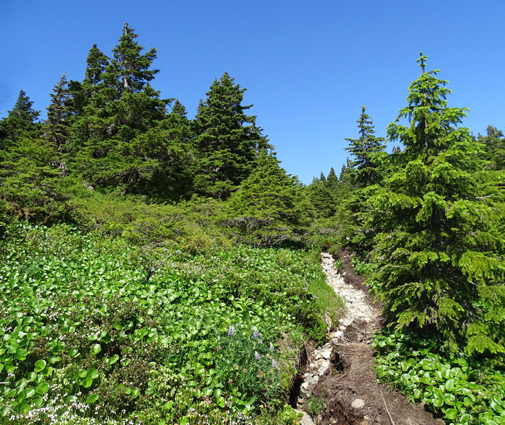 I reached the sub-alpine zone at or before 2,500 feet. 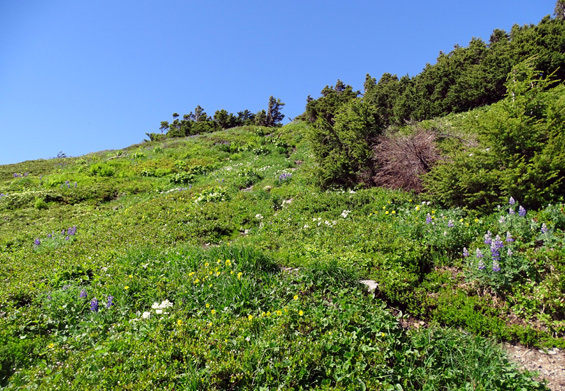 There were lots of flowers in open spots at that level and above treeline -- yellow buttercups, white marsh marigolds, sweet clover, and mountain cranberry, blue lupines, purple violets, pink Kinnikinnick, and some others. 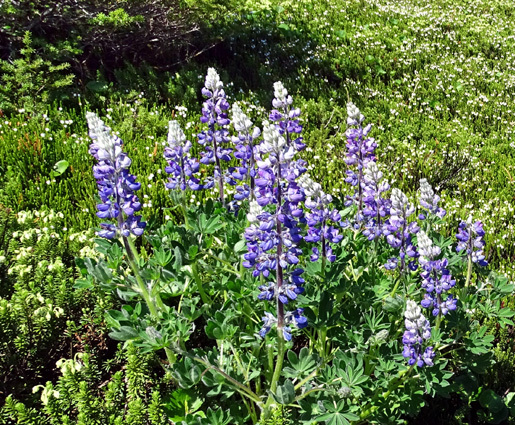 Above and below: whole hillsides were covered in lupines and other flowers. 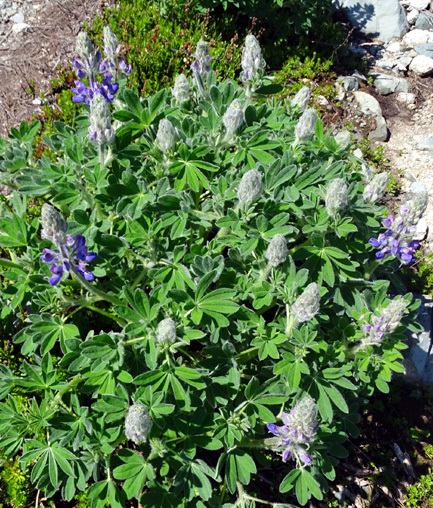 Lupines were at their peak at one elevation (above) but just starting to open higher up (below). 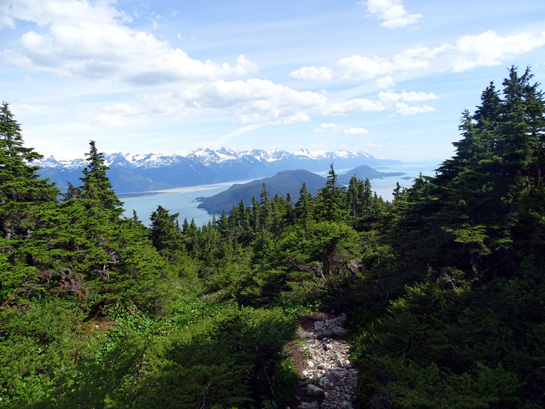 Even before reaching treeline I could see the south and north peaks, although I didn't know for sure that it was them until I came back down. There are a couple false peaks on the way up. There is a survey marker identifying the south peak so hikers know where they are.